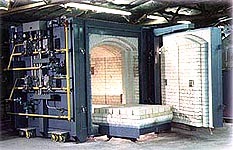 ANNEALING AND OTHER HEAT TREATMENT. 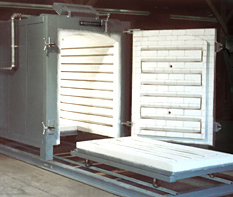 If you need to heat process ceramics, metals or glass in various ways and require flexible production schedules, or different cycles to different temperatures, then a UNIQUE/PERENY Carbottom/Shuttle Kiln may be the best choice for your application. Today, cycle flexibility is often essential for successfully achieving high productivity, better quality and low cost. That’s why so many UNIQUE/PERENY Carbottom/Shuttle’s are specified and routinely used for production at temperatures from 1000o F up to 3200o F (1750o C). Models are available in a wide selection of sizes from 35 cubic feet (1 cubic meter) to over 1000 cubic feet (28 cubic meters) capacity. In addition, UNIQUE/PERENY offers a Gas Fired Modular System concept which features an easily expandable design that can grow as your needs increase. Standard units have programmable microprocessor based controls and strategically positioned high velocity excess air burners to regulate heat input that surrounds and penetrates the load to provide close temperature control and uniformity. An energy efficient, low thermal mass ceramic lining allows for rapid heating and cooling. This is especially important when production needs are variable, and range from dense, tightly packed small items to large, heavy parts which require complicated heating schedules or quick turnaround. For greater productivity, additional cars, track, car haulage and automatic load/unload systems are available options. Steel body, welded and reinforced to form a strong, integral unit, attractively finished in heat resistant paint. Energy efficient, amply rated, lining with low heat storage reduces heat loss and lowers shell temperature. Easy rolling car hearth with flanged roller bearing type wheels. Programmable microprocessor based temperature instrumentation, control pannel and failsafe system wired with all necessary switches, meters, lights, relays, fuses and other UL/CSA llisted components. Comprehensive operation and maintenance instruction manuals. Factory inspected and shipped ready for installation and use. Product technical support, service and spare parts availability. Modular system design, easily expandable as needed. Additional cars, track and transfer systems. Two door design for “straight through” shuttle operation. Motorized door mechanism and car moving equipment Purchaser selected control instrumentation packages and panels. 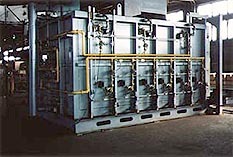 Dual fuel or oil only combustion systems. Automated material handling systems and load/unload equipment. Factory installation, startup or complete turnkey service. Ferrites, titanates, steatites, alumina, substrates, porcelain, abrasives, glass. Ferrous, non-ferrous, brazing, annealing, hardening, sintering, heat treatment. Installation of equipment in accordance with rating plates,instruction manuals and applicable codes.